One of my favorite topics is taxes, or more specifically avoiding taxes. Every year I go to great lengths to delay or even avoid taxes to the fullest extent of the law. I max out my 401k, Roth IRA and HSA. I itemize and take huge deductions for property tax and mortgage interest but I still find myself looking for more ways to save. That might make me greedy but I really hate paying taxes, especially when I know that the money is going to get wasted by the government on stupid things. Living in California doesn’t help matters either. 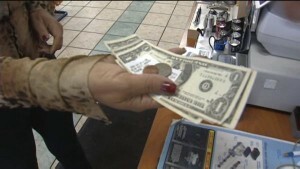 There’s a hefty income tax and a nice plump sales tax on all goods sold across the state. But recently, I’ve discovered a way to avoid paying sales tax on certain food and beverage items. The rules are pretty complex and your results may vary but it’s definitely worth a shot. If you couldn’t tell by all my food related posts, I love to eat. I try to cook a few times a week but I also find myself eating out quite a bit. I don’t go to real fancy places, in fact, most of my meals outside the house are at small hole in the walls or anywhere cheap that has great food. Most of the time, I’ll eat lunch at a restaurant, but I almost always take dinner back home. I was having lunch with a friend the other day and I noticed that he ordered his food “to go” even though we were eating in the restaurant. The place was a small hole in the wall sushi joint in a strip mall and the seating barely qualified as dining in but I didn’t know that some businesses won’t charge sales tax on “to go” items. Although the laws in every state are a little different(since we’re talking about state sales tax here), in California, cold food “to go” is not supposed to be subject to sales tax. The sales tax law in California on food is extremely complex. Merchants are supposed to charge tax if 80% of their sales are from food and drinks and an additional requirement states that 80% of the food and drinks have to be able to consumed on site. Confused yet? Merchants can also petition the Board of Equalization to exempt to go hot foods(like coffee), bakery goods and cold food(like sushi or sandwiches). In NY, you’ll have to pay tax if you want your bagel sliced. In CA, Coffee Bean won’t charge you sales tax, but Starbucks will. In OH, you don’t have to pay taxes on cold or hot food, as long as you order it to go. Here’s a personal example of just how confusing the whole “for here” vs “to go” tax situation can be. I decided to test out this theory over the past few months so I went in to Subway and ordered a chicken breast sandwich for $5. I got the bill and it was $5.44! “Dammit, what the hell?” I asked the cashier. And she told me that since I got a hot sandwich, they have to charge tax on it. If I would have ordered a roast beef or a turkey sandwich, then there would be no sales tax. A few weeks later, I went back into Subway and got a turkey sandwich with everything on it. I got the receipt and it was still $5.44! I asked why and the cashier told me that since I got the sandwich toasted, it’s now considered “hot” and I have to pay sales tax on it. See how confusing the whole thing can be? There’s no way I was going to eat a third Subway sandwich so I stopped my experiment right there. But I’m assuming that if you order a truly cold sandwich from Subway and take it “to go” you won’t have to pay taxes on it. I guess this is just one example of why our tax code is so messed up since I need a CPA just to figure out the true cost of my freaking sandwich. Readers, have you ever noticed a difference in sales tax price on food “for here” vs. “to go”? If so, what state are you in and do you always order “to go” or are the savings not worth it? Interesting! I’m not sure what the laws are in Missouri, but I think you have to pay tax on food regardless here. Yea like I said, every state is different. But I think it’s worth a shot, try a few businesses and see if they charge you tax or not on “to go” food. The laws are so confusing most businesses probably don’t even know what they should be doing. We have similarly complex sales tax rules here in North Carolina. I am an attorney by training (but didn’t practice law very much during my career). My brother set up a bakery business with to go only food sales. I was helping him by researching sales tax laws for his different products. We don’t pay any sales tax on groceries and medicine, however, which does help save on food costs if you’re cooking at home. Also in NYC only, there’s not sales tax on clothing items under $125 which is nice. Haha yea it’s weird how so many places in NY won’t take credit. I found that so odd when I was visiting considering it’s the complete opposite out here in Cali. Haha my thoughts exactly, how the heck would they prove/disprove any of this? I think we’re giving the IRS/government way too much credit if so haha. Wait, what? I’ve never heard of ANY of this! Are you saying if I order cold food to go I will not be taxed?? Haha YMMV but yes that is what I’m saying. You can even order hot food at certain places/states/cities. Pretty much the law is different everywhere so I’d just order to go and see what happens..
That is a wild sales tax rule! It really doesn’t make much sense at all.. But I would likely do the same if it did. I have an issue that when I go out to eat I will likely want to have a drink or two with dinner, and all drinks at restaurants are of course ridiculously overpriced. Your method would help avoid these costs as well. Haha yea I know. I really enjoyed eating at restaurants in NYC and Philly that were BYOB. The food was still reasonably priced and you got to bring your own bottles of wine…my kinda joint!